PLEASE NOTE: THIS LIFT KIT CANNOT BE MOUNTED ON RXV MODEL GOLF CARTS. Works great with our any of our lifted golf cart wheel and tire combos on up to 23" tires! How can I tell if my EZGO TXT/MEDALIST is a 2001.5-2013?? 2) 2001.5 and Up have the FOUR-bolt steering (where the steering column goes down and meets the floorboard). 1994-2001.5 have three bolt steering and will not work with this lift kit. *If your EZGO cart has a FEMALE threaded tie rod, replacement tie rod ends may be required as the replacement tie rod in this lift kit is male threaded. Please contact us prior to purchase with any questions. 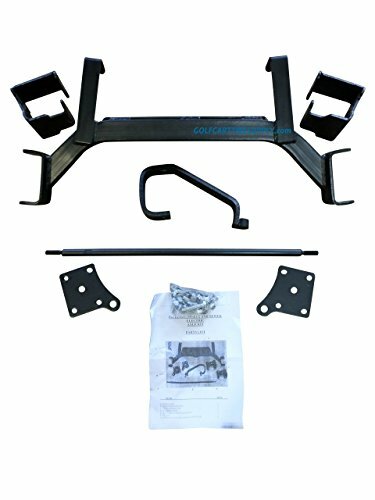 **This lift kit combo WILL NOT fit the EZGO RXV, ST, WORKHORSE, or any Yamaha, Melex, ParCar, or Club Car golf carts.